Do not forget. When having Agile Meetings, Managers, Stakeholders and clients have busy schedules as well. I wanted to make a post about a disturbing trend I've been seeing in different Agile environments. Agile Methodologies give the team members a certain level of respect and Responsibility. Team members are empowered to self-organize, reach out of their teams, arrange meeting rooms, and basically Get the Job Done. Product Owners, Managers, Project Managers, Stakeholders, Clients, and many other people are part of regular communications with team members where there was none before. This includes but is not limited to the Planning and Review meetings, constant email, voice and personal communication. This may be a new experience for many team members. In an environment where SCRUM or OpenAgile is NEW to the organization, this can be even more of a concern. If for instance, your team has arranged a review meeting for a specific date and time, you REALLY should make a point of being there on time. After all; you are expecting other people in the organization to show up so they don't slow you down. If you are a Scrum Master, acting as an OpenAgile Process Facilitator, or simply anybody interested in Agile as a framework, please consider not showing up for meetings on time to be a serious Obstacle or Impediment to success. Those that are invited are supporting you and treating you with the necessary respect to allow you to work in an Agile Environment. The same respect is due in return. Leaving a VP, CIO, CEO or any stakeholder sitting in a room waiting for 30 to 45 minutes while the team members meander in is not appropriate (and not very wise) in ANY environment. The difference when applying SCRUM is that this type of behavior, is MUCH MORE OBVIOUS and transparent to the organization. Those same people you are making wait will some day need to stand in a room to fight for your rights as a team. They may need to explain to another executive why they should make time out of their busy day to attend a team meeting and put other business off for an hour. Agile is not an open license to treat others as though their time is not valuable. The reason an Agile framework is successful is that it allows managers and those that used to "control" you to do other tasks which have their own significance and importance to the company or group you're in. They are ALSO busy! Scrum Master, Process Facilitator, Growth Facilitator. Managers or Leaders or Neither? I have recently read a book my brother-in-law let me borrow titled First, break all the rules *1. It is written based on results of a survey by Gallup of over 60,000 managers at 400 Corporations. The book is based on written and actual in-person interviews. It has an interesting concept regarding the difference between Great leaders and Great managers. -Great Leaders focus OUTWARD. This includes thinking about how the group, business unit, section, division, corporation, community will interface, operate and thrive in relation to the external world as his/her group moves into the future. The leader looks for upcoming obstacles, competition, market trends, and opportunities for growth within their realm. That realm could be at any level down to the smallest business unit or small group of people. Great Managers focus INWARD. This includes thinking about the personal interaction between the people and businesses in their care. This might include providing feedback on ways to improve, recommendations for training, guiding career futures, and helping their unit work efficiently as a group. In some cases, managers will have direct impact on what and how the employees under their care will grow and learn. I spent some time trying to figure out how to map these ideas to the Scrum Master, Coaching roles and to the Growth Facilitator and Process Facilitator capacities of Open Agile and had some trouble with the mapping. This MAY be the reason why corporations have such a hard time defining the roles and fitting them into their structure. Where does the OpenAgile Process Facilitator fit? A Process Facilitator is neither. Well, maybe more of a manager? What about the OpenAgile Growth Facilitator? Is that capacity more of a "leader"... Hmmm... doesn't quite fit. The Scrum Master role is even more obscure in this comparison. The Scrum Master is not managing anyone, yet still enforcing the rules of Scrum, encourages the improvement of skills and agile techniques and assists to protect the team members from outside interference. These clearly appear at first glance to be Manager attributes. However, the Scrum Master is not a manager. The Scrum Master is looking outward for potential obstacles, working to try and grow Agile in the organization and working hard to try and teach others as to its’ goals and purpose. These appear at first glance to be the role of a leader. However, the Scrum Master is not a leader. I now can see why Corporations have such a hard time identifying the Scrum Master in their organizations. Scrum Masters basically don’t fit either category, yet most corporate hiring is done based on hiring of “leaders” and “managers”. I have been thinking about some of the conversations I've had recently and in the past with different team members and realized....there seems to be very little discussion and truthfulness about the reality that high-performance teams are not for everyone. Some people will just never like it, some will tolerate it, some will love it, and some will just simply move on. So much time is spent on the rah, rah of how great it will be for everyone, we need to remember to pay attention to the natural reactions and concerns of those that have never experienced a high-performance team before. Speaking as a developer myself, I remember how I started in I.T. back in 1984. Someone presented me with a problem, and I sat in my apartment by myself working my own hours, watching TV, working through the night and generally being a loner. I do admit, I enjoyed those days. My company grew and eventually I found myself working with different types of people; developers, marketing types, sales people, accountants, graphic artists and many more. That's when I discovered something I enjoyed MUCH more.... Working in Teams! But what about those that are unsure about what to expect. My advice... Be TRUTHFUL and LISTEN. For those that have never worked in a high-performance team environment, the change can be frightening. Allow new team members to talk openly about their fears and concerns. Show them that you care. The concerns may not be real to you but they are definitely real to them! · You are working with a new team that has been told they are doing an Adoption. · They are comfortable working totally on their own and interface with other team members only when necessary. Our natural tendency will be to try and minimize their negative feelings or concerns. After all, we totally believe in Agile and really just want them to come around to our way of thinking. Instead, allow the person to say what they have to say and then be honest with them. Explain to them that “Teams are NOT for everyone, and ask them to PLEASE give it a try first and see how you feel about it in a year from now”. The LAST thing you want to do is try and convince that person that their fears are not valid. They are valid to them. Explain that you are there for them to talk to at any time. Explain that you believe in your heart that they will never want to go back to a non-agile environment. Don’t be afraid to talk about your own skepticism when you first started with an Agile team. I personally find that honesty and truthfulness about the situation is the best way to approach the subject. The recipient will gain trust in what you say. After all, if you are willing to be honest about possibly attrition, then they will realize you are being truthful about how things might be if they ride it out. For me at least, the people who have argued with me the most about joining teams have become my biggest allies when a management change happened and the POSSIBILITY of breaking up the teams even came up in conversation. My experience is that the honesty and rapport you built up with the person who was "worried", "not sure", "didn't think they would like it", etc. will be beneficial to both of you. The truthfulness you showed about their situation will help that person have a healthy, open-minded view to what will happen next. Consider how much easier future changes will be when the person is totally aware they may be uncomfortable with them and is willing to give it a try. The topic of verbal vs. other forms of communication has come up for me a fair bit recently with a friend of mine trying to keep an off-shore team working efficiently. His teams are using OpenAgile as a framework. I decided it was time to make a post about the subject. I came up with this example as a Flight Instructor when explaining to students about the difficulties that air traffic controllers face when talking to pilots on the Radio. The controllers cannot easily hear inflection in your voice, so the words used are very important and need to be completely accurate and follow specific rules. This idea is even more significant when discussing the idea of ‘documentation’ or ‘email’ communication between co-workers and/or team members. Consider the following phrase which is purposely designed to invoke emotion. I NEVER SAID YOUR WIFE WAS UGLY. Every person who reads this will read it differently! Let me explain..... Follow this explanation by saying each of the following OUT LOUD. The learning will be better that way. The () characters are the explanation of the different possible interpretation. Put a loud or raised emphasis on the bolded word. Say the rest of the words without emphasis. Leave a few moments before each attempt. As you can see, I may have had an intended purpose for my message to you. However, your interpretation could be considerably different than what I had hoped for. Agile Frameworks such as OpenAgile or SCRUM, rely on high-bandwidth communication between team members. Consider this example next time someone tells you that written communication is as effective as in-person or webcam verbal communication between members in high-performance teams. If you are in an environment requiring remote communications, make sure that the remote workers have access to high-bandwidth communications capacity within their teams. Recently, I was helping a friend of mine introduce OpenAgile into their environment. They are a software development house with some local and some overseas developers. I am occasionally following up with my friend to see how they are doing. Their development has been going well since adopting Agile practices with the exception of a recurring problem with "returning bugs". A bug will be discovered, fixed, and then several weeks later will show up again after some other modifications. This is a sure sign that Test Driven Development is not happening. There is a master data entry screen called "Shipment Entry". The first field on the form has a "Shipper" field that allows the entry of a Shipper Code. If you press CTRL-N, you Should get a sorted list of Company Names ordered by CompanyName, paged 20 at a time, with a smaller selection if some of the characters of the company name have been filled out. The resulting list should appear within 3 seconds. Today you downloaded the code, recompiled and find that the drop down does not sort anymore. You know that you have fixed this before. Introduce the Test Driven Development Mindset. Instead of opening a ticket, sending an email, complaining or whatever your process is, consider trying the following and introducing something like this into your source / version control. Shipper Field has an invalid entry "INVALID", CTRL-N pressed Within 3 seconds, a pop-up appears indicating "NO COMPANY FOUND", the shipper field is blanked and the cursor is returned to that location. The popup disappears. If any developer works on that screen, before checking in, they need to do all the tests on the SHIPMENT ENTRY TESTS document to ensure they have not broken anything. Don't get me wrong. The idea is not to document the entire screen up front! Try to avoid designing the ENTIRE UI up front in this way. That has it's own non-agile problems. This is just an easy way to introduce future changes using a different mindset. In my example above, there is a field called "Mode of Transport". It currently shows a list of numbers which internal employees "KNOW" from years of experience with the application. When that number is selected, it gets converted into something like "MAIL", "COURIER", when it is printed on the final document. Your team has agreed to do work to have it show the appropriate labels in a drop down on the screen. Traditionally (non-test mindset), you would send out an email or open up an issue with a request for this change. Then, the cycle will continue again. As time goes by, you will always need to re-check this is working properly. Mode of Transport Entry into Field Within 1 second, when entering this field, a drop-down list appears show full descriptions, sorted alphabetically by Mode of Transport. Granted, the tests will eventually become cumbersome. However, please remember that someone will eventually be testing these screens and find these bugs in a never ending circle. My friend found that every morning they were having to go through all the screens to see what "new things" were broken. Why not just try to get it right during your Cycle or Sprint ? In the above example, as soon as someone takes on this task, they will have a failing test (Red), they will do what they need to do to get the test to pass (Green), and then will adjust the code to be efficient (Re-factor). Although Test Driven Development is better done at other places in the code, this is a great way to introduce the "Mindset" into your team. Someone will eventually say "This is getting to be a hassle. Can we automate it somehow? ", which as an Agile person is exactly the words you eventually want to hear. Maybe now, you can start to introduce it at the Unit Test, or Functional Test or whatever level is appropriate to your organization. There are some more formal ways of doing TDD such as Extreme Programming (XP). The important thing is that your company will have shifted to a Test Driven Mindset. The quality of your product will increase and stay that way and the need to go back and fix old bugs in a never ending cycle can soon be a thing of the past. Inevitably, there will be some change to your team. Someone will leave or perhaps you will have new members joining you. Either way, you will be asked the question "Where should I sit?". Do not take this question lightly. You have the opportunity to make significant changes with the addition or departure of a team member. There are many different types of personalities in a team. Because of this, you cannot realistically expect the same personal interactions between people sitting next to each other. More importantly though, it is your responsibility as a Scrum Master, Mentor or Coach to consider the positive adjustments which can be made during this great opportunity for change. You have a developer sitting at an end station with a slightly restricted view from the rest of the team. This team member does not ask for help when he or she needs it. You will be adding a developer to your team. Trying to talk to the developer who does not ask for assistance, may help. However, why not consider using this opportunity to solve this problem in a different way. If the developer is moved to a more central location, they will not be as separated from the group. Perhaps this would give them more opportunity to ask for help, increase their communication level with peers, and if you are lucky, the other team members will more easily recognize that this is happening an spur this person on to get them to ask for help. So, where do you put a new developer ?... Certainly not off at the end by themselves. The new person will feel isolated, and will have a harder time integrating. The team is already a very close unit and has gone through the team development stages of Forming, Storming, Norming, and Performing. With the addition of the new team member, this cycle will start again and will make it even harder for them if they are on their own at the end of the seating layout. Reminding the team of the four stages of team development before a new person comes on board can be a big help. It reminds all team members of how hard it is to integrate new members and the likely result of the addition. Many people can get attached to their desks or workstations. Therefore, moving people around in a traditional environment can be a painful experience. In an Agile team, life is about change, adapting, adjusting to what is happening and making positive changes to improve productivity and enjoyment. 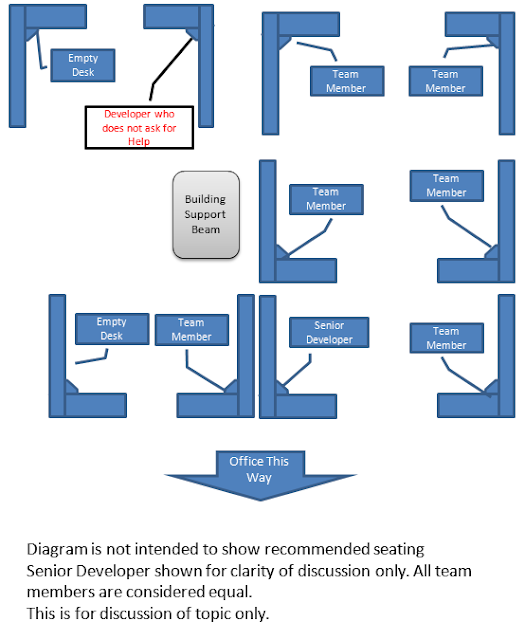 As team members move locations, they will learn different skills and ideas from the person sitting next to them. It will also be common place to adjust as necessary. Changing team member locations also helps change things up and gets rid of complacency. A danger for an Agile Team is no longer attempting to make changes and progress because everything is "fine" or "perfect". If you are hearing these things from your team in Review or Retrospective meetings, perhaps it is time to change desks just to get change happening again. There may be other personality or non-team type things you wish to address. Instead of bringing that person into an office and talking to them, you could solve things by simply changing desk locations. Better yet..... If you have a team that has embraces and practices Consultative Decision Making, why not ask the Team where the new person should sit to be most effective! They started their first cycle with great enthusiasm and with as much attention to detail as possible, but still ended up completing zero story points in their first cycle. Is this is a disaster ? The short answer... NO. The company has gone through two major releases based on non-agile methods with limited success. One of the owners of the company has been a long time friend and we discussed doing some Agile training with his employees to "see how they felt" about learning about OpenAgile. There were no commitments made to it. The idea of "Hey, let's learn about this and see if it's right for our organization" was the goal. All the team members were told that the company was considering (with emphasis on considering) switching to OpenAgile and would not do it if everyone didn't feel like it was worth the effort and made sense for them. It was stressed that OpenAgile is not a silver bullet and may not be right for them. The effort was purely exploratory in nature. I find that having management and stakeholder support and encouragement in the process is almost mandatory for Agile to work. Without the understanding from the owners of the company, the culture required to make it work will inevitably cause friction "around the edges" of the Agile team. Two days into the cycle, some of their overseas developers went "to visit family". They did not realize at the time, this was local code for "going on holidays". I heard from the owner later that if they had not asked why they did not get responses to emails, they would not have known the other developers were away. They simply took on too much work, didn't account for all the other overheads of a new team setup and issues that would take place with their remote environments. This did not mean failure. They learned how to re-organize themselves for future cycles. One of the great things to come out of their first cycle.... A potentially deliverable product within the first two cycles! One comment that was made to me was something along the lines of "Hey Mike, this reminds me of when we used to work together in the garage when we started the company. We all worked together on whatever needed to be done. That's what made us successful in the first place.".... Hmmmm. I am regularly asked for examples of where Agile Practices could be used that are not related to software development. I recently came across this video and just had to share the link to it. The company encourages all team members to participate, keeps things time-boxed and makes appropriate use of subject matter experts. It's awesome to see what can be done in 5 days. Teams are important when doing Agile .. Not just processes ! (This is a motivational story about teams). Scrum, OpenAgile, Whatever your flavour of Agile, there are rules, procedures and guidelines to follow. Consider them as Frameworks to work with. Many ideas are different between them, and each Framework has different uses with an organization. There are however, a few things they have in common..Process guidelines, Cycles or Iterations, and an emphasis on Team Based work or Team self-organization. Over the years I have discovered that whenever Process is involved, there is a huge temptation to talk about processes and cycles and forget about the people who need to follow them. The Team. Without them, none of these things can take place. I am not talking about "calling" a team a team, but simply just "having" them. I started my company back in 1984 and never realized at first, just how important the contributions of more than one person could make to the outcome of a project. Over time I learned that teams are (to me at least), the only way to grow and keep customers happy. Learning and getting used to the ideas were not easy at first and many mistakes were made, but in the end, I am so glad I stuck it out and kept working on it. I was recently reminded of a team story I can share where my team truly performed beyond all expectations and wanted to pass it along as a sort of "just believe in it" kind of message to those that are interested. In 90's, I ran an Internet Service Provider Business. It came about because of a process I had realized would work for Ocean Transport Companies where EDI data could be transmitted along with normal email and be sent over the internet (the days of $ 800 / month invoices for 2400 Baud Connections to the Internet). Through the process of meeting new clients, I met the director the Canadian division of a worldwide Shipping company and sold him on the idea. He has offices in Toronto, Montreal and Vancouver with partners in those cities and was part of a larger worldwide organization headquartered in Antwerp, Belgium. Local partnerships were setup in countries where the company did business. At the time, they had approximately 115 offices around the world, in North America, South America, Africa, Asia and the Middle East. Canada was one of those "sub-companies". The services were working very well in Canada and eventually I was invited to attend a partners meeting in Miami to review the process with managers, owners and stakeholders from North and South America as well as the CEO , who was based in Antwerp, Belgium. I did a demonstration for the group members there and was presented a great opportunity. The CEO from Antwerp asked me "How long would it take you to get my 750+ employees in Antwerp so they can have internet email as a pilot project for the group ?". My answer to him was that I believed we could pull it off in a few days (which would result in it being completed before our 4 day meeting in Miami). Now comes the great part... Late that afternoon, I made a phone call to the junior support person and asked "Roy, could you please do me a favour and see if you guys can find a way to get the customers' network in Antwerp onto our system as quickly as you can. "Sure" was the response I got. That was the extent of our conversation. I could not have asked for a better team! The next morning while we were arriving at the pool ready to start the day, the CEO from Antwerp came out with a big grin on his face and showed everyone an email he had received overnight to his new internet email account through our service. It seems that not only did the installation get done overnight, but a large number of the Antwerp staff were already sending and receiving messages through the new service. I could never have pulled this off on my own and could never have had this happen if the team was not empowered to make decisions. I am a firm believer that if you give the employees the power to make positive contributions to the company, it's simple.... They will. Within a few months, I was invited to a two week meeting in Cape Town, South Africa with the owners and managers of all the other International offices and did the same review. Because of the success of the team and the implementation, we started on a large project to integrate more than 100 offices around the world. Our team managed the installation, implementation and integration of all these offices together with teams from the client's IT department. The entire system was implemented well below the original budget estimates and in approximately half the original estimated time. I eventually moved on to other things and am still great friends with the Canadian Director. The company was eventually sold to a larger organization. As far as I know much of the initial "design" is still in place and being used including their own EDI standard. Of course, as technology has changed, some of the mechanics of transmission have changed, but the project is still considered a success many years later and is the foundation for most of their current communication environment. I could never have accomplished this without such a great team who really was concerned about doing the best possible job for the customer.